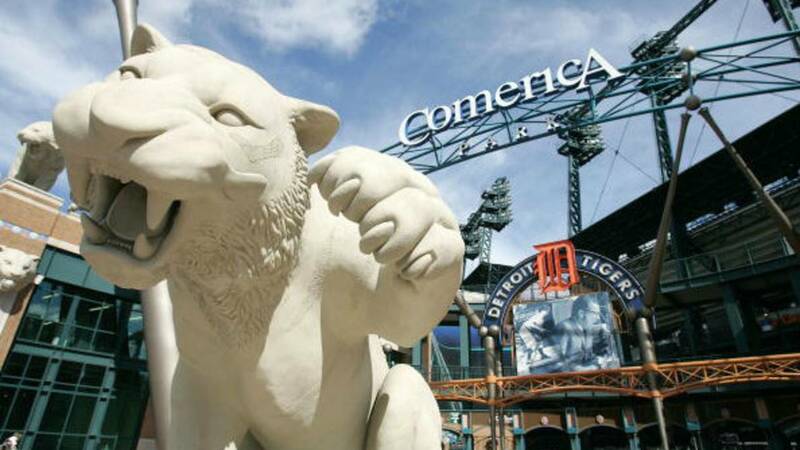 The Detroit Tigers Opening Day at Comerica Park is set for April 4 and the team is giving fans an early look at what's new at Comerica Park. The Tigers open their home slate with a six-game stretch of 1:10 p.m. starts at Comerica Park, welcoming the Kansas City Royals to town on April 4, 6 and 7, followed by the Cleveland Indians on April 9-11. The Tigers, in partnership with Delaware North Sportservice, are thrilled to announce additions to the Comerica Park food and beverage menu for the 2019 season. Over the years at Comerica Park, fans have come to appreciate new and traditional food offerings as a major part of their ballpark experience. All of us are certain that this year’s lineup will live up to that expectation. Coney Dog Eggroll – Crispy eggroll filled with hot dog and chili, drizzled with classic mustard and a sprinkle of diced onions. Featured in the Food Court Midtown location. Beyond Burger – Plant based burger that looks, cooks and satisfies like beef topped with lettuce, tomato, onions and pickles and served with French fries. Featured in the Food Court Corktown location. Beyond Burger Bowl – Plant based burger that books, books and satisfies like beef on a bed of lettuce with tomatoes, onions and a pickle balsamic dressing. Also, featured in the Food Court Corktown location. French Onion Burger – Fresh burger smothered in Swiss cheese and caramelized onions, with a tangy zip sauce on the side, served with French fries, featured in the Food Court Corktown location. Al Pastor Dog – Natural casing hot dog topped with smoked pulled pork, pineapple relish, sriracha aioli, and cotija cheese. Sold in Food Court Downtown location. Bahn Mi – Thick slab of bacon topped with Asian slaw and sriracha aioli. Sold in Food Court Downtown location. Hand Carved Gyro – Soft pita filled with sizzling carved gyro meat, diced tomatoes, tzatziki sauce and red onion. Featured in the Food Court Greek location. Falafel – Soft pita filled with falafel, diced tomatoes, tzatziki sauce and red onion. Sold in the Food Court Greek location. Topped Falafel – Falafel topped with tomatoes, cucumbers, red onion, black olives and tzatziki sauce. Sold in the Food Court Greek location. Zeppole – (zeppōˈlē) Sweet deep-fried Italian pastry dough balls served with chocolate dipping sauce. Featured in Food Court Midway location. Guernsey Ice Cream – Featuring two new flavors – Blue Moon and Detroit Grand Slam. Augmented Reality Souvenir Soda Cup – All large soda cups will have triggers that can be scanned with a cell phone for interactive play via the MLB App. Chicken Wings – Smoked chicken wings, marinated in a spicy beer marinade and served with celery sticks and a choice of BBQ or ranch dip. Sold in the Michigan Craft Beer location at Section 101. French Onion Topped Fries – Crispy French fries smothered in Swiss cheese and caramelized onions and drizzled with a tangy zip sauce. Featured in the Michigan Craft Beer location at Section 101. Craft Beer Flights – Enjoy three seven-ounce craft beer choices from Michigan Craft with our new Beer Flight. Chimichanga – Barbacoa chicken with shredded monterey jack cheese inside a flour tortilla, deep fried and topped with white cheddar queso, pico de gallo, and sour cream on a bed of lettuce. Served with Spanish rice and black beans. Sold in the Tiger Den. Italian Sandwich – Mortadella, capicola ham, and salami with shredded lettuce, tomato, red onion, banana pepper rings and Italian dressing on a sesame sub roll. Sold in the Miller Lite Pitcher's Pub. Farm Field Table Moroccan Spiced Beef Sandwich – Ras el Hanout rubbed beef, toum, pickles, onions, and olives on an artisan roll. Featured in the Corner Tap Room. Loaded Nacho Fries – Hand cut French fries topped with cheddar queso sauce, pico de gallo, jalapeno peppers, and cotija cheese. Sold in the Corner Tap Room. Garden Salad Jars – Fresh spring mix, cheese and vegetables layered in a jar with ranch dressing – all to be shaken and enjoyed, right from the jar. Also available with chicken. Garden and Grain Salad Jars – Fresh spring mix, quinoa, farro, brown rice, cheese and vegetables layered in a jar with ranch dressing – all to be shaken and enjoyed right from the jar. Also available with chicken. Fresh Fruit Cups – Cups of refreshing melon, pineapple, berries and grapes. New Healthy Packaged Snacks – Sabra hummus and guacamole snack cups and Oh Snap Pickling Co. veggie or pickle snacks. Entering his first season as the voice of Comerica Park is Jay Allen, a long-time public address announcer in Grand Rapids, whose experience includes Minor League baseball, arena football, special events and a variety of high school sports. Jay’s distinctive voice was selected after a rigorous audition process that began with more than 50 applicants. Allen, replaces long-time PA announcer, Bobb Vergeils, who retired to Florida after the 2018 season, but continues to serve as the public address announcer for the Tigers Spring Training games at Publix Field at Joker Marchant Stadium. Multi-compartment backpacks are traditionally the most difficult and time-consuming bags to search at security checkpoints. This update aims to make the ballpark experience for all fans safer and more efficient, which are two major priorities of our organization.